To aim of the study was to investigate the effect of bilio-pancreatic diversion (BPD) on type 2 diabetes in patients with BMI <35 kg/m2. OGTTs were performed and anthropometric data were compared between five diabetes patients (BMI 27–33 kg/m2) following BPD and seven diabetes patients after a low-energy diet. Insulin secretion was computed by C-peptide deconvolution. A euglycaemic–hyperinsulinaemic clamp was performed only in the BPD group and the M value measured. One month after BPD, fasting and 2 h post-OGTT glycaemia decreased from 15.22 ± 3.22 to 6.22 ± 0.51 mmol/l (p = 0.043), while insulin sensitivity increased significantly. No significant changes were observed in the low-energy diet group. Insulin secretion did not differ significantly after either intervention. Diabetes amelioration (change in HbA1c level) was observed up to 18 months after BPD without pharmacological therapy. BPD can achieve adequate control of type 2 diabetes also in patients with BMI <35 kg/m2. The rapid postoperative remission of diabetes is primarily related to an improvement in insulin sensitivity. Gastrointestinal surgery can induce long-term remission of type 2 diabetes in patients undergoing bariatric operations for morbid obesity . Experiments in a non-obese type 2 diabetes rodent model demonstrated that surgical control of diabetes by gastrointestinal bypass is the direct effect of the anatomical rearrangement of the small bowel, independently of weight loss . Surgical control of diabetes may thus be potentially obtained also in patients who do not meet current criteria for bariatric surgery (BMI >40 kg/m2 or BMI >35 kg/m2 with high-risk comorbid conditions). Recent reports corroborate this hypothesis showing that a variety of operations, including Roux-en-Y gastric bypass , duodenal–jejunal bypass  and gastric banding  can dramatically improve diabetes in patients with BMI <35 kg/m2. The physiological basis of the improvement in diabetes after surgery is still unclear; however, the dominant hypotheses involve changes in hormone signalling from the small bowel, which may influence insulin sensitivity, insulin secretion, or both. In this pilot study, five type 2 diabetes patients (BMI 27–33 kg/m2) underwent bilio-pancreatic diversion (BPD) in order to treat diabetes. The BPD group was compared with diabetes patients under an energy-restriction programme. The aims of the study were: (1) to evaluate the degree of glycaemic control and its durability in the short- to mid-term; and (2) to determine insulin secretion and insulin sensitivity early after the operation, to investigate their role in the mechanisms involved in the rapid improvement of diabetes after gastrointestinal bypass surgery. A group of five patients undergoing BPD was considered sufficient for the aims of this pilot study. Inclusion criteria were type 2 diabetes according to the American Diabetes Association criteria , HbA1c >7.5%, BMI between 26 and 33 kg/m2 and age between 30 and 60 years. Exclusion criteria were: type 1 diabetes, renal or hepatic failure, major psychological disorders, pregnancy and previous abdominal surgery. Neither gastric complications nor major side effects occurred following the surgical procedure. All patients received oral vitamin and iron supplementation and dietary suggestions. 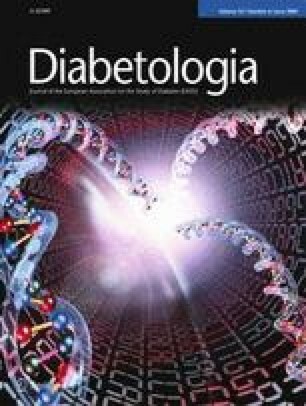 A matched group of type 2 diabetes patients (three women and four men) was selected from a large database including patients before and 1 month after a daily energy deficit of 2,090–4,180 kJ/day, calculated as resting energy expenditure × 1.4 (measured by indirect calorimetry with a Deltatrac II Metabolic Monitor [Datex-Ohmeda Instrumentarium Corp., Helsinki, Finland]). Weight loss was 0.5–1.0 kg/week. The studies were approved by the Institutional Review Board and Ethics Committee of the Catholic University—Policlinico Gemelli (Rome, Italy). All patients gave written consent. BPD was used since this is the standard of care for bariatric patients at our Institution. An open BPD was performed , although the majority of centres worldwide currently perform bariatric surgery using a laparoscopic approach to minimise risks. The procedure included a distal, horizontal gastrectomy which leaves behind a 300–400 cm3 sized upper stomach. This remnant stomach is anastomosed to the distal 250 cm of the small intestine (alimentary limb). The excluded small intestine (including the duodenum, jejunum and part of the ileum) carries the bile and pancreatic secretions (biliary limb) and is connected to the alimentary limb at 100 cm proximal to the ileocaecal valve to create the ‘common limb’, the only segment where bile and nutrients mix. Body weight was measured to the nearest 0.1 kg by a beam scale, and height to the nearest 0.5 cm using a stadiometer (Holtain, Crymych, UK). Body composition was estimated by isotopic dilution . HbA1c levels were measured before and 1, 3, 6, 12 and 18 months after surgery and 1 month after the diet. A 75 g OGTT was performed in each patient at baseline and at 1 month after surgery or diet (blood sampling at 0, 30, 60, 90, 120 and 180 min). Glycaemia was measured by the glucose oxidase method (Beckman, Fullerton, CA, USA). Insulinaemia was assayed by microparticle enzyme immunoassay (Abbott, Pasadena, CA, USA) with a sensitivity of 6 pmol/l and an intra-assay CV of 6.6%. C-peptide was assayed by RIA (MYRIA; Technogenetics, Milan, Italy) with a minimal detectable concentration of 17 pmol/l and inter- and intra-assay CV values of 3.3–5.7% and 4.6–5.3%, respectively. Fasting and total insulin secretion rate (ISR) after the OGTT were calculated by deconvolution of C-peptide concentrations  and expressed in nmol min−1 m−2 body surface area. Total ISR was computed as the integral over the 3 h of the ISR after the OGTT. Insulin sensitivity was calculated from the OGTT by the oral glucose insulin sensitivity (OGIS), which provides an index that is analogous to the index of insulin sensitivity obtained from the glucose clamp . Peripheral insulin sensitivity was evaluated by a euglycaemic–hyperinsulinaemic clamp (EHC). Prior to the clamp, plasma glycaemia was maintained in a physiological range by an overnight insulin infusion. Whole-body glucose uptake was calculated with respect to fat-free mass (FFM) as the M value (µmol kgFFM −1 min−1) calculated during the last 40 min period of the steady-state insulin infusion. Data (means ± SEM) were analysed by SPSS statistical software (version 13; SPSS, Chicago, IL, USA). The Wilcoxon signed-rank test was performed to compare data from the same patients before and after the interventions. ANOVA with repeated measures was used to detect glucose and insulin changes over time during the OGTT. Two-way ANOVA was performed to compare the BPD with the diet group. p < 0.05 was set as significant. Between April 2006 and January 2007, five patients (two women and three men) underwent BPD. At the time of the first study, diabetes duration in both the BPD and diet groups ranged from 3 to 15 years and the patients were on either oral hypoglycaemic agents or insulin. One month after BPD, FFM, fat mass and HbA1c were significantly reduced in both groups (Table 1). Although both interventions allowed a reduction of plasma glucose levels over time, glycaemia after OGTT was significantly (as asterisked in Fig. 1a) lower after BPD than after diet (2 h plasma glucose: 15.22 ± 3.22 and 6.22 ± 0.51 mmol/l, before and after BPD, respectively, p = 0.043). In contrast, with the exception of fasting insulin, insulin levels did not differ significantly between diet and BPD groups, probably as a consequence of quite a large inter-individual variability (Fig. 1b). After BPD, plasma insulin concentration decreased from 94.80 ± 14.00 to 37.80 ± 3.23 pmol/l (p = 0.004) at fast and from 359.88 ± 115.82 to 121.65 ± 35.67 pmol/l 2 h after the glucose load (p = NS). ISR did not differ significantly between groups. Fasting ISR was 0.90 ± 0.22 before and 0.99 ± 0.96 nmol min−1 m−2 after BPD (p = NS) and 1.08 ± 0.17 before and 0.95 ± 0.12 nmol min−1 m−2 after diet (p = NS). Despite not being statistically significant, total ISR showed a decreasing trend from 17.63 ± 8.07 to 9.06 ± 3.91 nmol min−1 m−2 after BPD. In contrast, total ISR remained practically unchanged after diet (from 17.04 ± 6.89 to 14.43 ± 4.16 nmol min−1 m−2). Interestingly, insulin sensitivity was higher after BPD than after diet (p = 0.013), as assessed by the OGIS index (330 ± 19.78 before and 425 ± 15.27 ml min−1 m−2 after BPD, p = 0.043 and 360 ± 19.70 before and 392 ± 14.43 ml min−1 m−2 after diet, p = 0.398). Before BPD, total ISR logarithmically decreased with the increase of diabetes duration (y = −25.569 log e (x) + 65.118; R 2 = 0.86). An unexpected result was that in a single patient, whose ISR before surgery was almost undetectable and diabetes onset was 15 years before BPD, the ISR both at fast and after OGTT had a relevant rise (from 0.00001 to 0.036 nmol min−1 m−2 and from 0.00004 to 3.67 nmol min−1 m−2, respectively). One month after BPD, insulin-mediated whole-body glucose uptake significantly (p = 0.043) increased from 16.64 ± 0.56 to 30.80 ± 0.86 µmol kgFFM −1 min−1. Average insulin levels at the EHC steady state significantly (p = 0.043) decreased from 104.80 ± 6.80 to 85.20 ± 3.90 pmol/l, suggesting an increase in hepatic insulin clearance. A significant (p = 0.032) correlation between M value and total insulin secretion was observed (y = 1 × 107 × e−0.2052x ; R 2 = 0.83). BMI decreased from 30.94 ± 1.05 to 25.36 ± 0.93 kg/m2 (p = 0.043) 12 months after BPD and remained constant at 25.07 ± 0.88 kg/m2 (p = 0.043) after 18 months. HbA1c levels were significantly reduced at 3 and 6 months (6.28 ± 0.33%, p = 0.042, and 5.88 ± 0.29%, p = 0.042, respectively) and fully normalised after 12 and 18 months (Table 1). Gastrointestinal surgery as a treatment for type 2 diabetes in mildly obese or non-obese patients has recently become a matter of intense debate. Only a few studies have reported on the efficacy of gastrointestinal surgery in non-obese diabetes patients using standard Roux-en-Y gastric bypass , gastric banding  or novel procedures such as duodenal–jejunal bypass . This is the first prospective case series study showing that BPD can achieve rapid, complete and stable remission of type 2 diabetes in patients with BMIs between 27 and 33 kg/m2. Compared with the energy-restricted group, BPD produced a larger decrease in glycaemia, both at fast and during a 3 h OGTT, a reduced fasting insulinaemia and a net improvement of insulin sensitivity at 1 month. Further studies and long-term data are needed to evaluate the effect of BPD on insulin secretion and sensitivity in type 2 diabetes patients with BMI <35 kg/m2, as well as its effects on incretins, appetite-regulating hormones and adipokines. Our preliminary study, at 1 month, indicates the efficacy of BPD in the treatment of type 2 diabetes in patients with BMI <35 kg/m2 as compared with diet. Larger clinical studies are needed to identify new variables for patients’ selection irrespectively of BMI levels. We thank A. Caprodossi for her expert technical assistance.